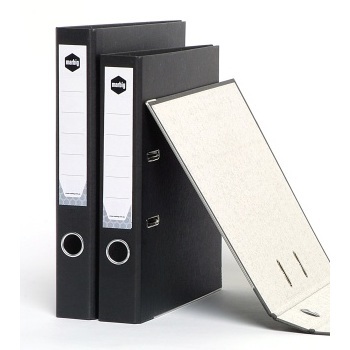 Economy Board Lever Arch Files in black mottle finish with paper spine label. 70 mm capacity - Available in both A4 and Foolscap sizes. 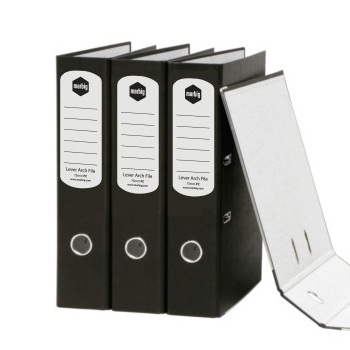 Reinforced Board Lever Arch Files with solid colour spines with mottle effect sides. 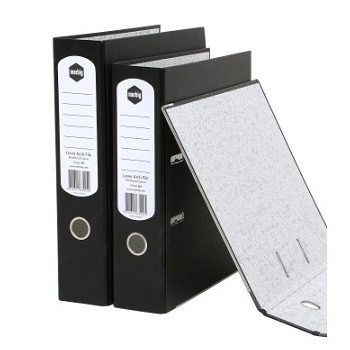 Constructed from 100% recycled board with Spine label holder for easy file identification. Complete with Rado fitting, Finger Pull (hole in the spine) and wipe clean covers are laminated for protection against wear and tear. Metal shoe for long lasting durability. 70 mm capacity - Available in A4 and Foolscap sizes in a choice of colours. 50 mm capacity (holds up to 250 sheets of paper) - Available in both A4 and Foolscap size.